The ‘Healthy Workplaces Manage Stress’ Summit took place on 3rd and 4th November in Bilbao, bringing the 2014-15 Healthy Workplaces Campaign on ‘Managing stress and psychosocial risks at work’ to an end. 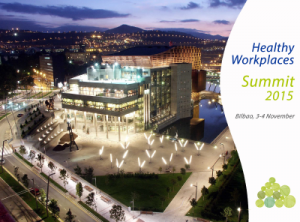 The 2015 Healthy Workplaces Summit brought together leading European experts and decision makers. They got together to exchange good practices and explore future strategies for managing stress and psychosocial risks in European enterprises. The event also gathered more than 300 participants from all over Europe who have contributed to the success of the Healthy Workplaces Campaign. Working towards reducing the burden of depression in the workplace is among the EBC’s core activities. In this vein, the EBC will be organizing a conference entitled ‘Lifting the Dark Clouds: What Can Europe Do to Reduce the Burden of Depression in the Workplace?’, on 9th December in Brussels, Belgium.